This is an important discovery, the Norwegian oil company says as it completes drilling in the northern part of the Barents Sea. The well drilled about 200 km north of the Norwegian mainland holds up to 4 million standard cubic meters of oil (SM3), the Norwegian Petroleum Directorate informs. It is located only eight kilometers north of Johan Castberg, the field that will be developed by Equinor. It was drilling rig «Songa Enabler» that did the discovery. The rig encountered a 35 meter oil column on 1415 metres depths below the sea surface. «This is an important discovery. It helps us determine the size of the Johan Castberg resource base which is currently being developed,» says Equinor senior vice president Nick Ashton. «The Skruis discovery confirms the potential in this part of the Barents Sea,» he adds in a press release. The resources of the Skruis could ultimately be included in the development scheme of the Johan Castberg. Equinor intends to launch production at the latter in 2022 and additional nearby resources adds value to the license. However, Equinor does not have the available capacity to develop additional projects until after 2026 and the Skruis will therefore have to wait, the company makes clear. «Through the Johan Castberg field development we open a new oil province in the Barents Sea, enabling us to tie in this type of small discoveries that will be highly attractive when the infrastructure is in place,» says Knut Gjertsen, project director for the Johan Castberg development. The Johan Castberg holds up to 650 million barrels of oil and is among Equinor’s biggest new development project. It is located on 72 degrees north and will be the northernmost field in production in the Barents Sea. 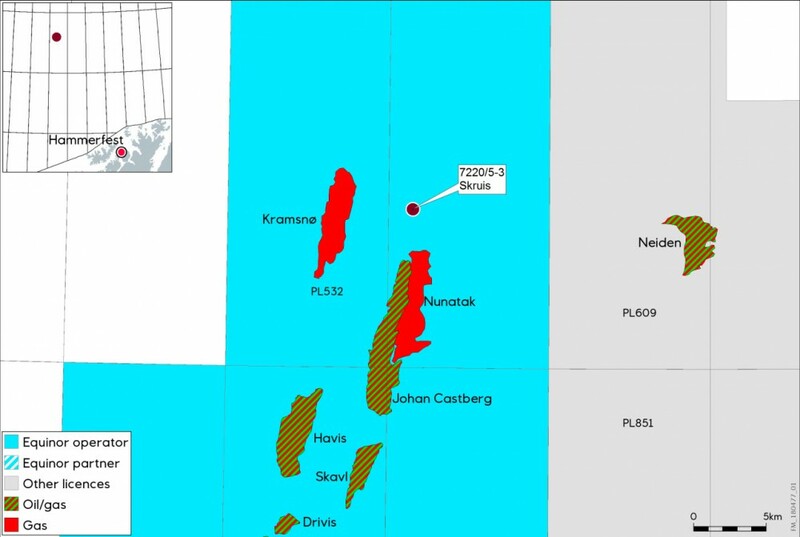 Equinor has now drilled a total of nine wells in license 532, the area that includes both the Johan Castberg and the Skruis. The Norwegian company will now move on with operations on the prospect Intrepid Eagle in PL615 in the Hoop area of the Barents Sea.